The next two fimm out of the swamp are done and dusted. I have some more almost done on the painting table, but I thought I'd pop these up in the meantime. The converted fimm is the most heavily armed one I've done thus far, with a helm and various other odds and ends of armour. 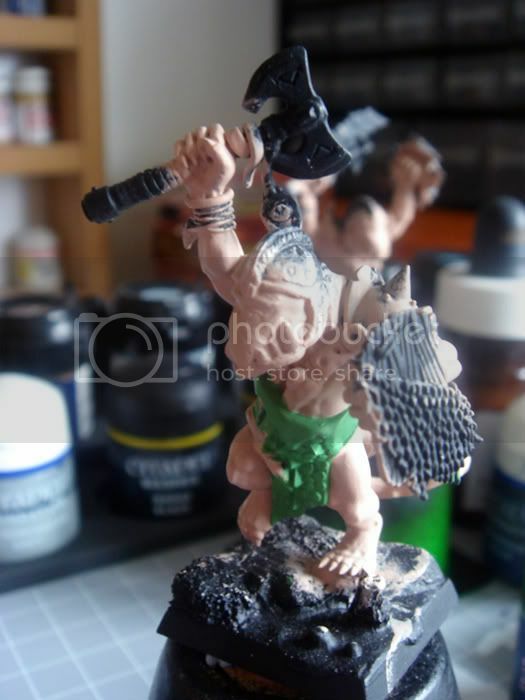 His axe was an idea I got from Fimm of Fimm McCool's Games Orkshop. His fimm have converted dwarf weapons to give the fimm that Celtic vibe, and I unceremoniously stole the idea as it looks gooood. The other fellow is an out of the blister bog raider from Bloodmoon Miniatures. They're having a bit of a re-jig at the moment, and are returning in the Summer. 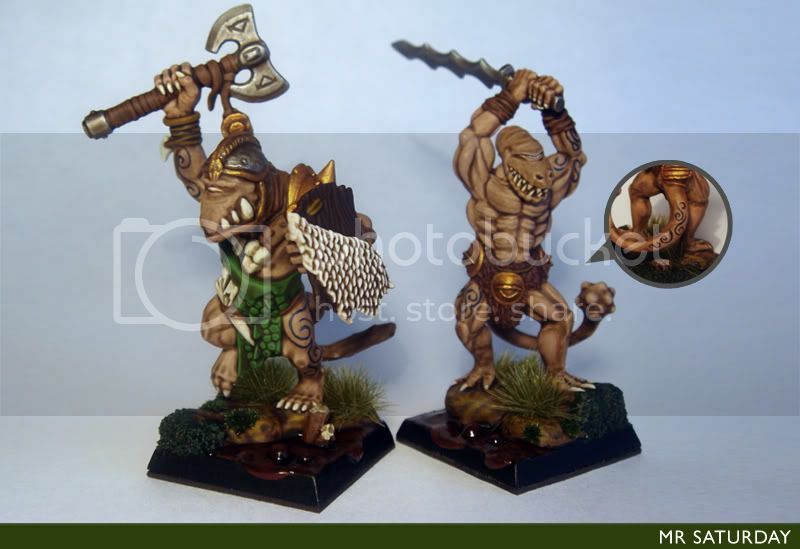 I picked a few of these lads up before I had decided on the road-to-madness savage orc idea, and I was loathe to leave them out altogether, so I have a few of them in the fimm units to give the unit more variety in pose, even if they are quite different from the converted fimm. Once hidden away in the unit they fit in pretty snugly. 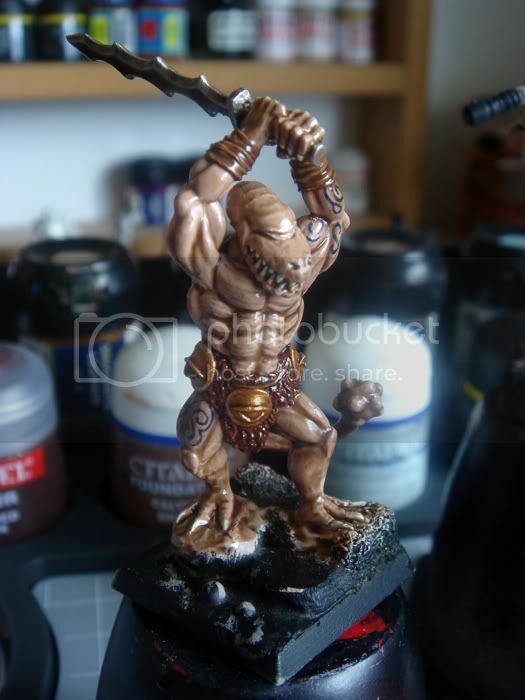 My good pal RedCraig over at the Blog of Grudges has been beavering away on a little project he'd now like to share with you all. You can check it out here. As the man says: I MADE A THING. Fantasy MathHammer, an android app. Get it here. It's free, and has no annoying pop up advertisements. It simulates combat between units of your choice, and lets you know the result of 10 repeated combats. This is not a subject, one would imagine, that gets much attention. Usually the warhammer player is so engrossed in getting their army painted that by the time they have enough painted to field on the table they either call it a day or move on to a new army. That, of course, is if they get the army finished at all. So, for those few who get the army done to their satisfaction, and wish to continue, there is another level of dementia to descend into. This would be adding such non-combatant or not totally necessary models to the army such as themed terrain, themed models, elaborate movement trays, army display boards, objective markers and so on. Producing most of these models means you have already achieved the glorious objective, the painted army. Personally I love all this kind of paraphernalia, as it adds character to the army. I recently had the fortune to see a really excellent Goblin army with plenty of odd bits and bobs. There were some great themed models, such as a chariot (or was it a pump-wagon) on an actual spring, so it wobbled when moved, and a fanatic whose base concealed a battery so, you guessed it, you could make him spin! Other models I've seen in this vein recently have been Retroalias' objective marker from The Magnificent Bastards blog. 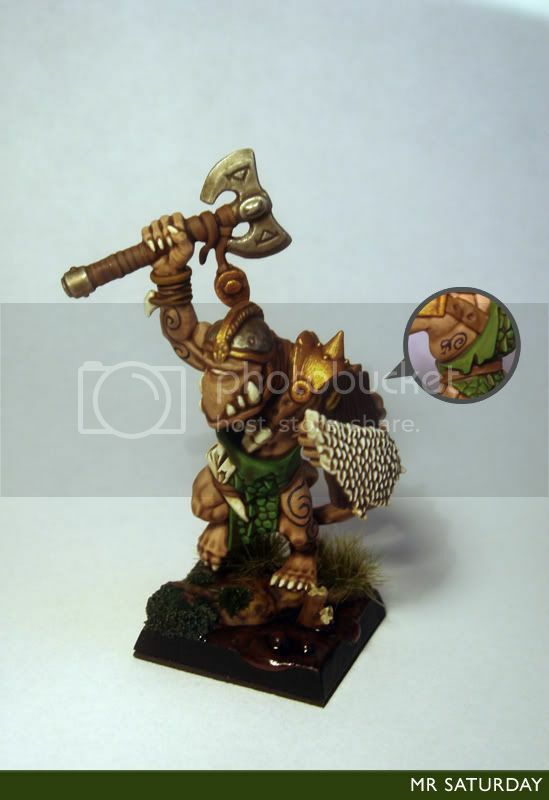 From the same blog, Johnny Hastings' (of Pointhammered fame) dwarf traders are just pure groove. For an army with some narrative, these little touches can really bring the whole game to life in a way that facing bandwagon internet list no.5 can never do. 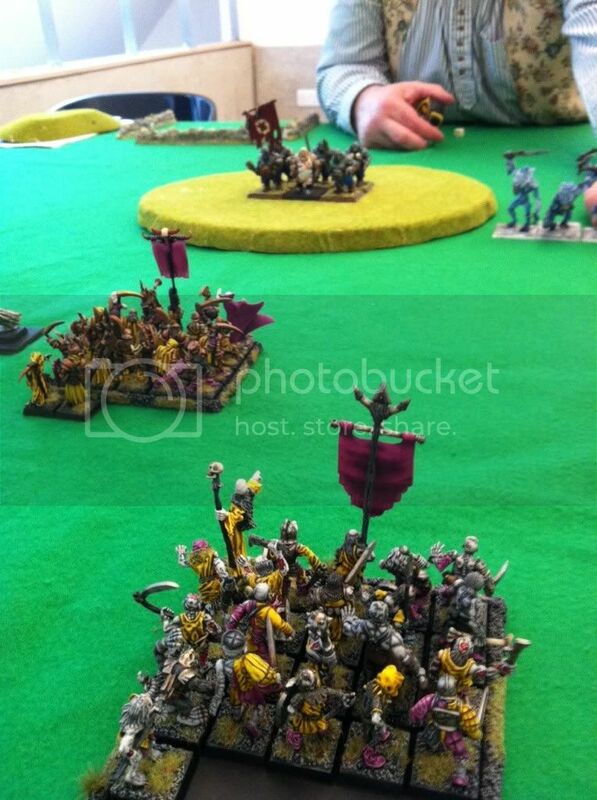 As I've banged on about in the past, the visual aspect is one of the main reasons I play this game, and playing on a beautiful game table with 2 well-painted and if you're lucky themed armies is something you want every time after you've experienced it. 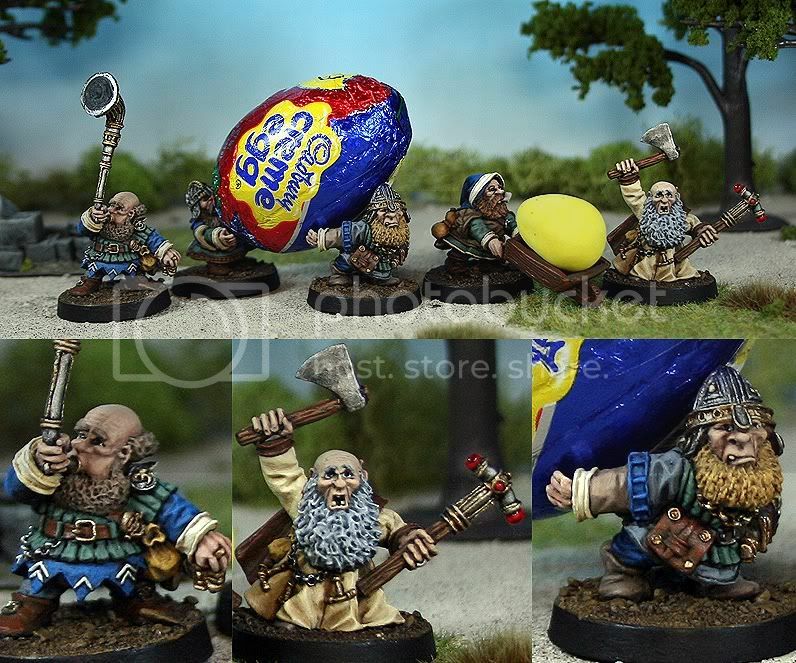 While looking about the webs for this post I saw this stroke of wonder from Blue of Blue's Marauding Miniatures. Words can't express how much I like the Cadbury's egg carriers. Cue round of applause. For my own endeavours, I have great plans for adding flavour miniatures and models to all my armies, (chaos dwarf coal transport, anyone?) but for now they are confined to my vampire counts. I generally model casualty markers for each unit, which makes it easier to tally dead units at the end of the game. They were also very handy for marking destroyed zombie units that had been raised for victory points, though this is no longer an issue as raised units no longer grant points. Heh. 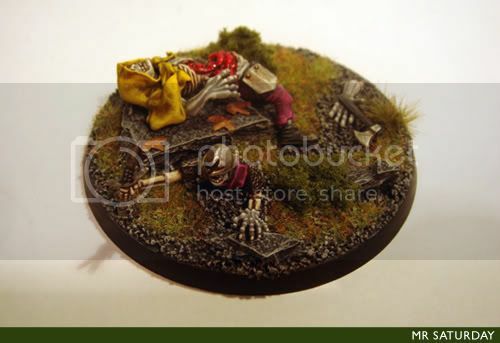 I have plans for more undead terrain, camp followers, mighty empire army markers and so on. Better get the bleedin' army painted first then, eh? 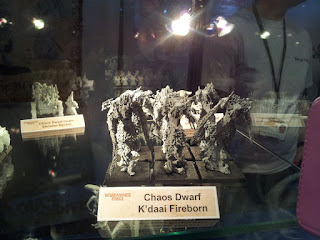 The new chaos dwarf k'daai fireborn are now up on the Warhammer Forge site for pre-order. They come in at £36 for a set of three, available from April 27th. All we had previously were the photos from the Forge World open day, so it's nice to get some more close-up shots. I'm certainly leaning more toward liking these lads, the helmets are cool, and they seem to have a kind of metal skirt attached to their breastplates. I'd really love to see someone give these a good paint job, it would be quite the task with the flames to do them justice. I suspect they would look great. I'm still not convinced to abandon my own idea of converting Warmachine jacks into fireborn, (bless you, game shop bargain bits bin) but I am casting a more glad eye on these fellows now. Last weekend I found myself at a stag. Nothing untoward there, you might say, as well as what the hell has this to do with gaming? Now, if I were to tell you it was a stag demanding full Victorian costume where everything from Texas hold em' to warhammer was being played, it might seem a little more unusual and slightly more on topic. Suffice to say, it was an outstanding event with numerous occasions where I was laughing so hard I thought I might pass out. I have to tell you, playing warhammer wearing a top hat and a monocle is the only way to fully appreciate the game. I took my vampire counts for a test drive with a new 8th edition list, and was not disappointed. Hex wraiths are fragile, but boy are they useful. It was a small points game, so I didn't get to try out much, but I must say the ability to field single spirit hosts is also full of undead-flavoured win. Hmm. Undead flavoured. The magic is different enough to take a little getting used to, but still good. Overall, based on this small game I do like the changes in the vampire counts. 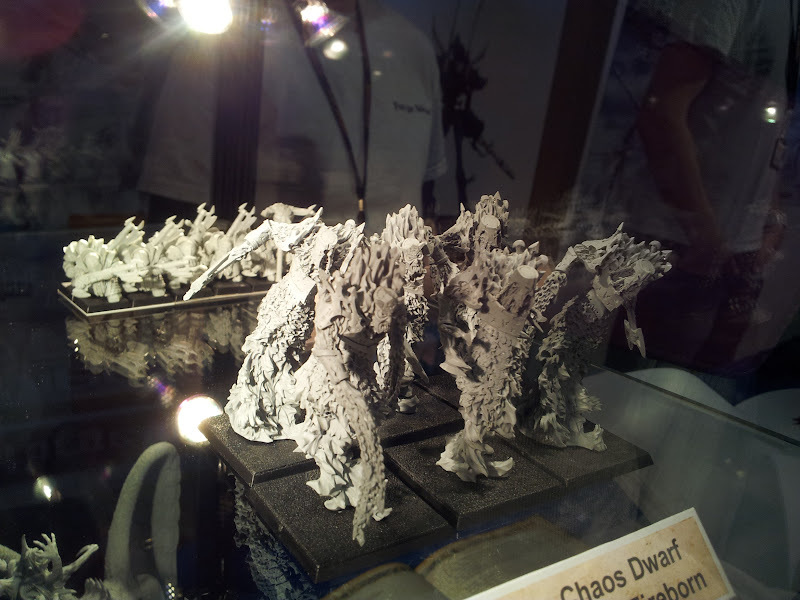 I am eager to try a unit of eight crypt horrors next time, as well as the mortis engine. Ahh...new book toys. Later, finding myself playing poker with men whose moustaches defied gravity as well as fashion was again a very satisfying if slightly unsettling experience. I felt I needed a derringer in case of any misunderstandings. In any case, one thoroughly recommends warhammer, Victorian style, my most august and sombre readers. I've started another batch of fimm warriors. In this batch are the first of the few Bloodmoon Miniatures 'bog raiders' that I'm sprinkling into the unit for a little variety. They area little different from the savage orc conversions that make up the bulk of the unit, but I like them, and the army can weather a little difference from fimir to fimir, I think. Far from being a purist about it, I in fact like that some fimir are larger (the fianna fimm) some bulkier, others leaner, that there's a variety in digits, tails and so on. Nothing crazy now, no two-headed fimir, that would be too chaotic, and the fimir in question would most likely end up killed and burned by his clan, but just a little leeway in physical appearance is fine and dandy. When you're desperately scraping about for enough miniatures to make up an army, I find a little give and take helps! The second fimm here is more heavily armoured than those I've done before. He's the first fimir I've used the helmeted head variant on, and I've given him a converted (dwarf) axe for a more Celtic look, as well as various straps and other bits of armour. Hopefully once painted the helmet will look the part. 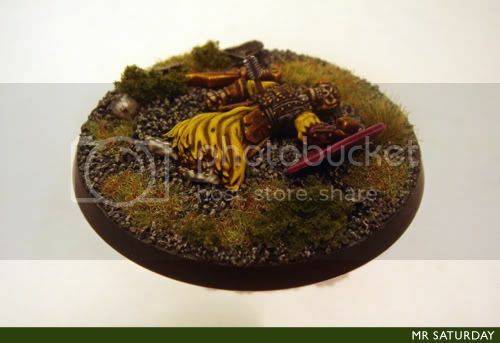 I spotted this fellow on Greebo Miniatures, who produce some really fantastic Blood Bow... ah, I mean Fantasy Football miniatures. Being a bit of a Blood Bowl fan, I was perusing the undead team, and in particular the amazing wights, when I saw this new release, Femo, the chained cyclops. Now, I might be a bit fimir-centric these days, but to me, he seems very much like a rather large and somewhat obtuse looking fimir, with his big rock on his back and all. I mean, 'Femo'? It's pretty blatant. I'm sore tempted to pick him up, either as a filler for my second fimm unit, or as a standard/musician for a fianna fimm unit. Perhaps a little sculpting around the eye might be in order, but essentially, as he is. I can already feel a back-story for the big rock bubbling away. What do folks think? Is one mad? I know, odd title. It'll all make sense though. I'm quite the hunter of Warhammer books, old army books, scenario packs and so on. I have quite a haul at this stage, but every so often I come across something special. I have an especial fondness for the publication of the 80's, they remind me of the early days of my obsessions, and give me a happy little glow. Recently one of these little gems, the book (sadly not the whole box) from Bloodbath at Orc's Drift came into my possession. I've been following Thantsants exploits with Orc's Drift on Somewhere the Tea's Getting Cold for some time, and very much enjoying it. StTGC is a site of pure win. To that end, purusing through the book is a whirlwind of pure nostalgia, Gary Chalk's art is wonderful to the point I get a little misty eyed. Anyhow, I hope to follow in Thantsants footsteps and re-fight the scenarios, though with a little less devotion to the original rules and minis! In other news, having had a better look at the new Empire miniatures from Games Workshop, I have softened in my opinion somewhat. I still think the luminark looks daft, but they others, they grow on me. There, I've changed my mind. A man's allowed to do that, you know. Warhammer Forge - K'daai Fireborn Models Spotted! The first pics from the Forge World open day are in, (thanks to Minudra from Warseer) and among the gems are some tantalising shots of the new models for the k'daii fireborn for the chaos dwarves. It's hard to get a good look at them from the shots taken, but from what I can see, they look like they have potential. They are tall models for a 40x40, which I like. Painting all that fire and lighting effects will be fun. I'm dying to get a better look at them. I'm still planning on using jacks from Warmachine as the basis for mine, but...we'll see. 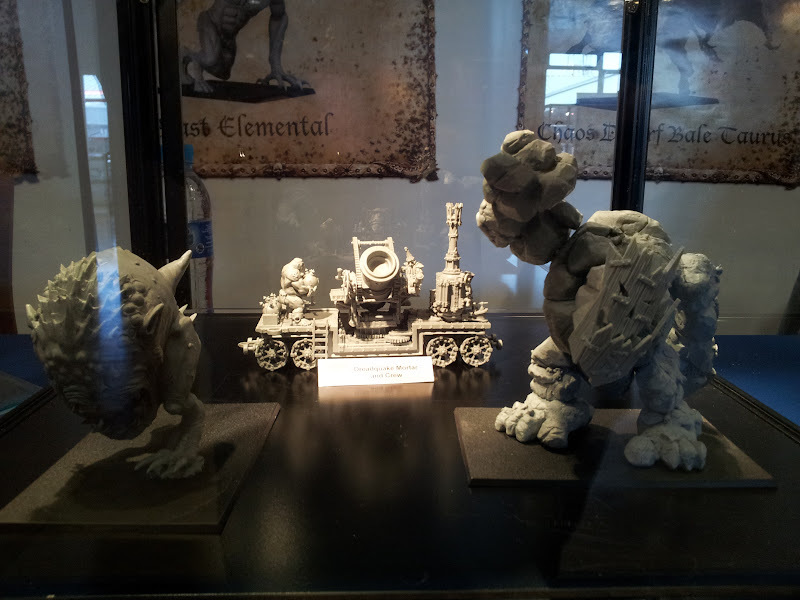 Also, look at the size of that squig!